Place 1 cup cereal in resealable food-storage plastic bag; seal bag and finely crush with rolling pin or meat mallet (or finely crush in food processor); set aside. In medium bowl, beat 1 tablespoon butter and the granulated sugar with electric mixer on low speed until creamy. Add crushed cereal and remaining Whoopie Pancake ingredients. Beat on medium speed about 1 minute, scraping bowl occasionally, until smooth. On cookie sheets, drop batter by tablespoonfuls 2 inches apart. Top half of them with whole cereal pieces. Bake 7 to 8 minutes or until tops spring back when lightly touched. Cool 2 minutes. Gently remove to cooling racks; cool completely, about 30 minutes. In small bowl, mix cream cheese, butter, strawberry syrup and powdered sugar until creamy. Add red food color; mix well. Assemble whoopie pies by spreading 1 to 2 tablespoons filling between 2 pancakes; the top pancake of each should be a pancake that was baked with pieces of whole cereal on top. Roll edges of whoopie pies in additional crushed cereal. Serve immediately, or cover and refrigerate until ready to serve. To squeeze some fruit in, add diced strawberries or pineapple to the filling. 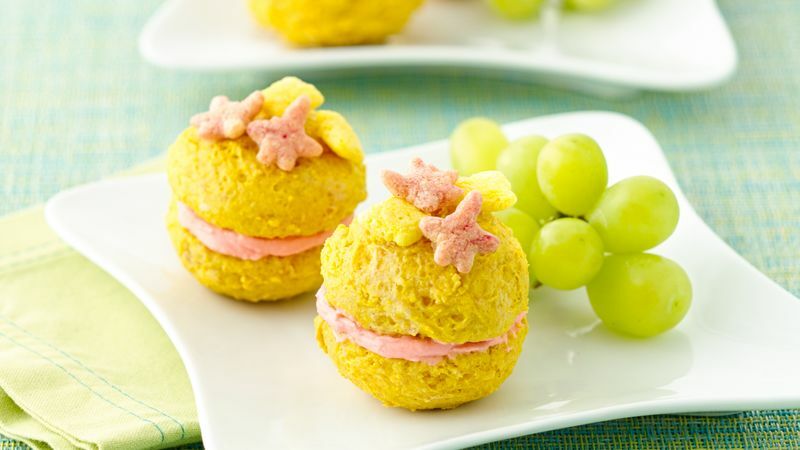 Food color really enhances the fun SpongeBob visual appeal of these whoopie pies. It can be left out as well. ©2014 Viacom International Inc. All rights reserved. Nickelodeon, SpongeBob Square Pants and all related titles. Logos and characters are trademarks of Viacom International Inc. SpongeBob Square Pants Created by Stephen Hillenburg.